Mark, thanks for the advice. I'm experimenting on the bottom of the plane first. I may try some Future under the decal to help with silvering. I was procrastinating putting on the shark mouth decal and for good reason. It was very difficult to position and broke right at the upper corner. It will take more decal solvent but it should lay down. I didn’t want to have to paint to fix it but I will have to. Oh well. Lots of difficult curves in that area. I dreaded this for so long. Actually this is before Solvaset Decal solvent which works miracles with repeat application. No doubt I see red, black, and white paint as well as an art brush in my future too. Just wish I still had those young eyes! Ouch, Vince, I feel your pain! Hopefully the Solvaset worked its wonders. I had to use some on my current build to get the decals to really lay down in the panel lines. That's hot stuff and it slightly melted one of the stars on the wings, which was I believe an old Superscale spare I had to use. Fortunately most of the damage should be hidden once I complete the weathering. I think I've had one problem or another with every sharkmouth I've used; sometimes I'm lucky and the issues are minor but other times not. Where you able to salvage the missing section under the spinner, or do you have to repaint it? I've had to do my share of touch-ups over the years. Yeah Mark, I tried leaving that piece under the spinner attached when I did the port side, first. It was just too hard to line it all up and was a big mess. So the side you see here, starboard, I decided to get ahead of it and cut it.. to be added last. Solvaset it awesome but really "hot". I have a small amount set aside and cut with some water to tone the power down a bit. The port side is looking better with these large wrinkles. They are nearly gone! Solvaset is quite the miracle fluid. After several applications, the wrinkles are almost gone! It just takes patience. Also it is so "hot" you have to avoid brushing over it too many times. Just put it on...and wait. Note that I also have a small vial of Solvaset/water mix. This mix is less caustic and is good for very thin decals. still be required. 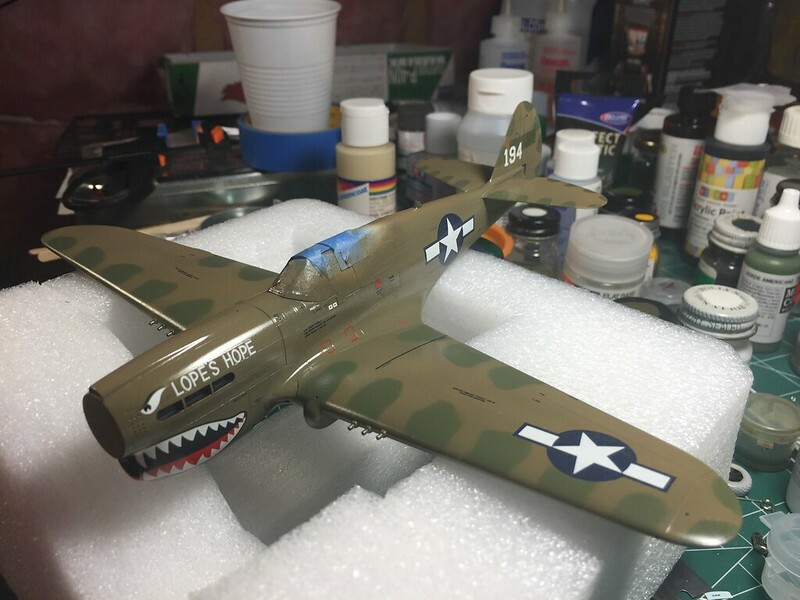 This is one reason I will think twice about doing another shark decal unless it is included in the kit. The Eagle Strike sheet was made for Mauve or AMT but that means it is not a perfect fit for either! All of this is telling me that it would have been impossible to finish for the contest due to the decal step taking so long. I mixed my paint with Future which made it very tough and partially shiny. So, I skipped adding a gloss coat for decals. I was out of town last week so work on the project has taken a slow turn. 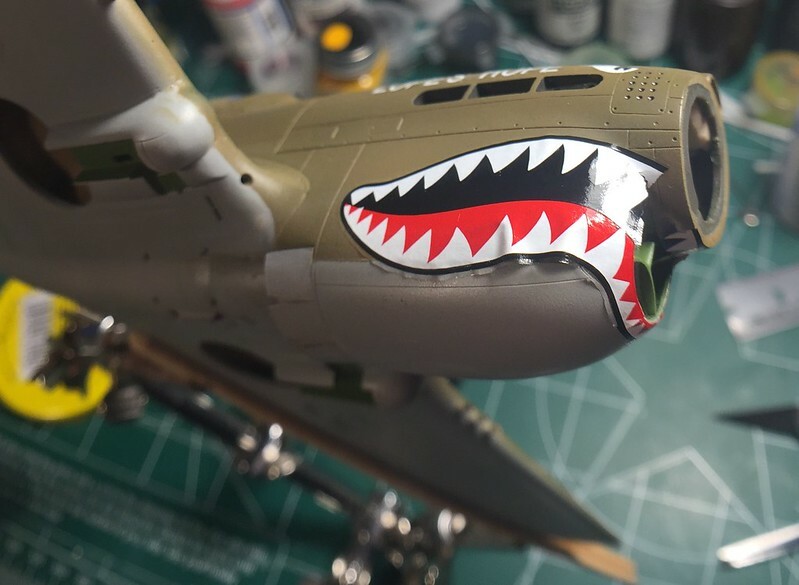 All the decals are on and the sharkmouth has been cleaned up, though. I should have put another coat of future before decals because it was not smooth enough. I spent so much time with decal solvent trying to get them to lay down all the way. The next step is a coat of Future to seal the decals before weathering. Fortunately I did a few more experiments with airbrushing Future and found an adjustment issue with the airbrush that I think I have fixed. The Future was coming out spitting and I'm so lucky I figured that out before putting it on the model now. I have like three old "paint horse" models coated with crappy layers of Future...and I'm okay with that! I was wondering what was going on, Vince, so thanks for the update. I too have some old warhorses that I use to test paints and Future on. I'm never quite fully satisfied with how I airbrush Future, so am thinking of switching to another type of clear coat. I practiced spraying Future until I was satisfied. Now I have an overcoat of Future on top of the decals. This will protect everything from oil based weathering to come next. Don't we always end up working in an 8 inch square? 8"? I wouldn't know what to do with that much space! Looking great, Vince! I noticed how shiny your Future coat is. I think that's one of my issues with using it. I'm so afraid of applying too much that would fill the engraved panel lines that I probably don't apply enough for a really good glossy coat for the decals. As long as you don't "pool" the Future or start it sagging, it lays down in the end. It looks too thick but after two days of curing you can even see scratches. I have to admit that it is harder to handle than say Testors GlossCote but I do like it when it can be laid down just right. Your airbrush has to "atomize" it well and you need a light to see how heavy you go. Also, I have misted on a tiny bit to start...from a distance. This little mist coat allows it to hang on to something. I only suggest practice and you may start liking it. Sometimes I had trouble with Future, not sure what, maybe I needed more coats? Often enough I didn't seem to get the gloss.